Can’t login to SQL Server with Windows Authentication? Forgot to add the local administrator account to the sysadmin server role but SQL Server is configured for Windows Authentication only? If you can change SQL Server to mixed mode Authentication, it would save you having to do a reinstall. The SA account will be automatically created on every new SQL Server installation. But this account is disabled by default if you select Windows Authentication during setup. In this article I’ll show you how to enable mixed mode authentication after installation, and unlock / enable the SA account login if you’re locked out of a SQL Server instance. Navigate to the registry location: HKEY_LOCAL_MACHINE\SOFTWARE\Microsoft\Microsoft SQL Server\MSSQL10.SQLEXPRESS\MSSQLServer, where MSSQL10.SQLEXPRESS is the name of your SQL Server instance. Restart your SQL Server instance for this change to take effect. First of all, you need to stop your SQL Server service so the password recovery software can access the master.mdf database offline. Download the SQL Server Password Changer on your computer. After you’ve downloaded it, double-click the setup file to install it. 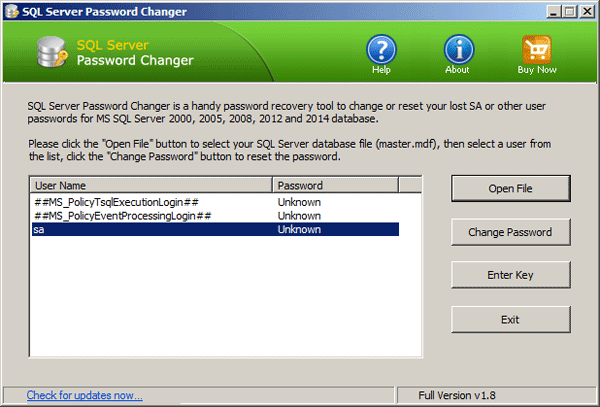 Start SQL Server Password Changer. Click on Open File button and select the master.mdf database for your SQL Server instance. In my example, the master.mdf file is located in C:\Program Files\Microsoft SQL Server\MSSQL10.MSSQLSERVER\MSSQL\DATA. 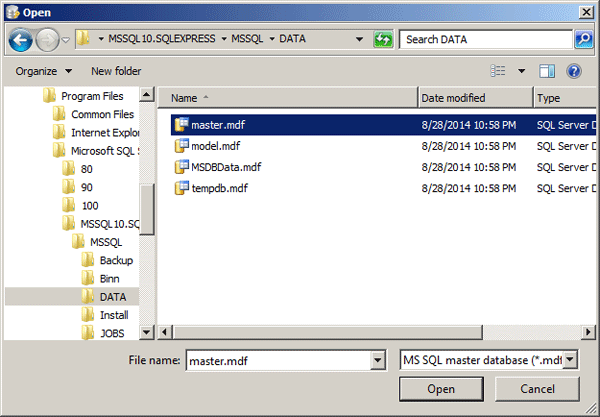 The program will extract all the SQL Server logins from the master.mdf database. Choose the SA account and click on Change Password button. Set a new password in the popup window and click OK.
Now you’ve successfully enabled / unlocked the SA account. Start your SQL Server service and you can now login to the SA account with your new password! It’s that easy! Locked out of HP Envy dv6 notebook because you’ve misplaced or forgotten your Windows 8 password? Despite being Microsoft’s most secure operating system, it’s possible to bypass or reset Windows 8 local/Microsoft account password with PCUnlocker. This article explains how you can easily bypass Windows 8 password on HP Envy dv6 notebook. How to Bypass Windows 8 Password on HP Envy dv6? Use a spare computer to download the PCUnlocker program. Unzip the downloaded file and you’ll get a pcunlocker.iso image. Burn the ISO image to a blank CD using the freeware ISO2Disc. If you don’t have an optical drive, you can burn the ISO image to a USB flash drive. Next, you have to boot your locked HP Envy dv6 notebook from the CD/USB drive. Because this Windows 8 laptop comes with UEFI BIOS, you need to firstly enable the Legacy support in the BIOS. Turn on the computer and immediately press the Esc key repeatedly until the Startup Menu opens. Use the arrow keys to select BIOS Setup and press Enter. 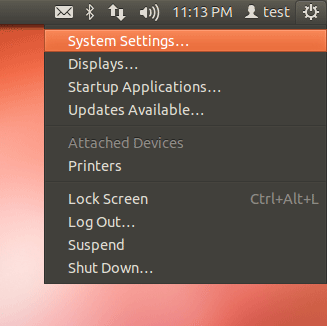 Navigate to the System Configuration menu, use the down arrow key to select Boot Options, then press Enter. 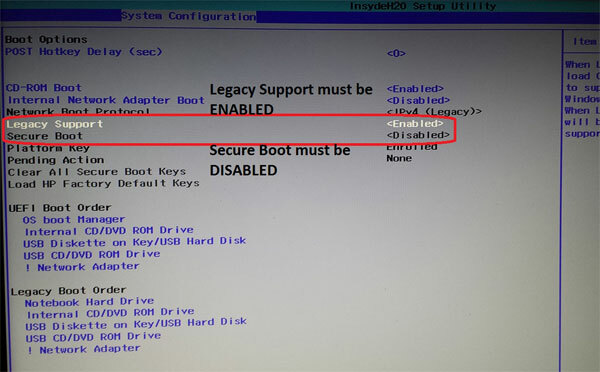 Set “Secure Boot” to “Disabled” and set “Legacy Support” to “Enabled”. Press F10 to save your changes and exit BIOS. When the computer has restarted, quickly press the Esc key to access the Startup Menu again. This time select Boot Device Options and press Enter. When the Boot Option Menu screen appears, use the up or down arrow key to select your boot media (Internal CD/DVD ROM or USB Hard Drive). Then press Enter to boot into that device. The computer will load the Windows PE operating system from your boot media and take you directly to the PCUnlocker program. Choose the user account where you want to bypass the password, and click on Reset Password button. If you use a Microsoft account as your login method, make sure you choose the local account with the “Description” column shown as your Live account ID. The program will remove your local account password immediately. As Windows 8 can’t accept blank password for Microsoft account, the program will assign a temporary password Password123 to your Microsoft account. The last step is to reboot your computer and take out the CD or USB drive. When you come to the Windows 8 login screen, you can log on as your desired account and regain access to all files on your HP Envy dv6 notebook. That’s it! Forgot the login password for your Dell Vostro 3560 laptop? How can I bypass or reset a lost administrator password? If you do not want to run the cracking tool on your computer for days/weeks/years in attempting to decrypt the login password, you can quickly delete the forgotten Windows user password with PCUnlocker. In this article we’ll walk you through the steps of resetting lost Windows 8 or Windows 7 password on your Dell Vostro laptops. How to Unlock Dell Vostro Laptop After Forgot Windows 8 or 7 Password? Use a spare computer to download the PCUnlocker program. Unzip the downloaded file and you’ll get a pcunlocker.iso image. Burn the ISO image to a blank CD (or USB flash drive) using the freeware ISO2Disc. After you have the disc, you have to boot your locked Dell Vostro laptop from CD. Turn on the computer. When the DELL logo appears, press F2 immediately to access the BIOS Setup. Navigate to the Boot tab, use the arrow keys to move CD/DVD/CD-RW Drive (or USB Storage Device) to the top of bootable device list. If this screen has a setting labeled “Boot List Option”, it indicates your computer is preloaded with the latest UEFI firmware instead of traditional BIOS. You need to change the Boot List Option from UEFI to Legacy, disable Secure Boot and enable Load Legacy Option Rom. Save your changes and exit BIOS Setup. The computer will automatically reboot from your burned CD (or USB flash drive). 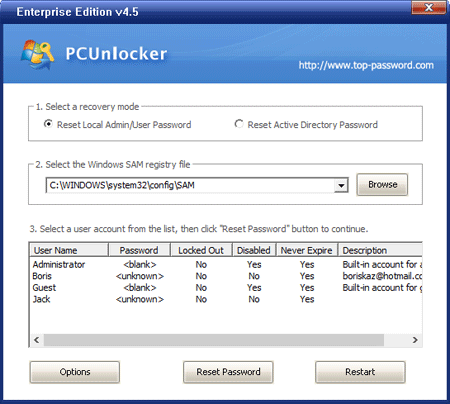 If everything goes as expected, you’ll come to the PCUnlocker program which shows you a list of user accounts for your Windows installation. 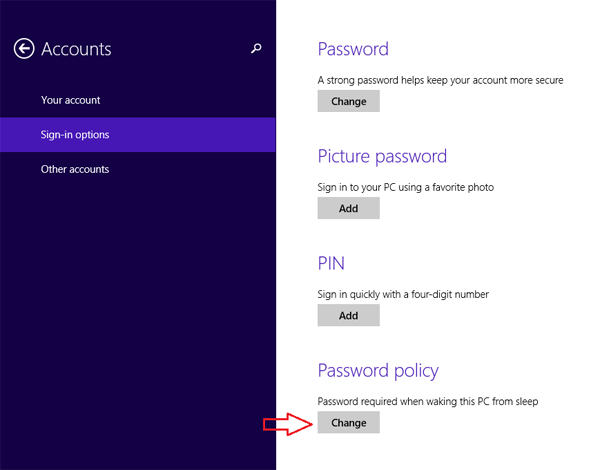 Choose one of Windows accounts and click on Reset Password button. It will unlock / enable the selected account and reset the password as well. If the selected account is a standard account, it will also been promoted to an administrator account. The last step is to simply click on Restart button to reboot the machine. Make sure to remove the CD or USB so it doesn’t boot again. If you’ve changed the Boot List Option from UEFI to Legacy, you have to switch it back again. Now when you boot the machine the password for that user should be gone! Unable to boot an UEFI-based computer from Windows 7 installation DVD? Have you received the error “Windows cannot be installed to this disk. 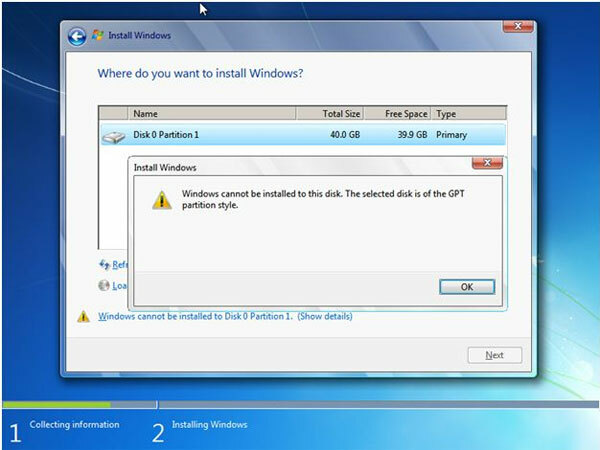 The selected disk is not of the GPT partition style” during Windows 7 setup? These problems might happen when you downgrade from Windows 8 to Windows 7 or perform a clean install of Windows 7 on an UEFI/GPT computer. Many new computers are shipping with the option to boot Unified Extensible Firmware Interface (UEFI) instead of standard BIOS. Secure Boot is a feature on UEFI-based PCs that helps increase the security of a PC by preventing malware from running during the boot procedure. However, it can also prevent PC owners from installing other operating systems – including Linux and older versions of Windows like Windows 7. So if you’re going to install Windows 7 on UEFI/GPT computer, you need to enable the Legacy boot option and disable Secure Boot. Additionally, you might also need to convert your hard drive from GPT partition style to MBR, because Windows cannot boot from GPT disk in legacy BIOS mode. In this article I’ll walk through how to install Windows 7 on an UEFI/GPT computer. How to Install Windows 7 on UEFI/GPT Computer? To start off, you need to enter your computer’s BIOS setup. Disable the Secure Boot option and enable the Legacy boot mode, not the UEFI mode. Check out this article for detailed instructions: How to set a PC to boot with Legacy BIOS mode instead of UEFI mode. Put your Windows 7 installation DVD in the CD drive and set your computer’s BIOS to boot from CD. After booted to the DVD, you’ll come to this screen. Close the command prompt window and continue the Windows 7 Setup installation. After the release of Windows 8, most of the new laptops and desktops are shipping with Windows 8 pre-installed. If you’ve become accustomed to Windows 7 and don’t like Windows 8’s new Metro UI, you can downgrade to Windows 7. Windows 8 Pro comes with a feature called Downgrade Rights, which means you can downgrade from Windows 8 to Windows 7 without paying a penny or having to format the hard drive. If you want to try this, just make sure your new computer has downgrade rights because not all Windows 8 computers are on the list. These rights are available to PCs which come with Windows 8 Pro pre-installed and not for users who have upgraded to Windows 8 using the promo offer. So it is basically only Windows 8 Pro OEM users. You can only downgrade to Windows 7 Professional or Windows Vista Business, not Windows XP. To learn more about downgrade rights, please check out this complete guide from Microsoft. Tips: You might need to provide your Windows 8 license key for validating your purchase during exercising your Windows 8 Pro downgrade rights. If you’ve lost the key, you can use KeyFinder Plus to recover it from your current Windows 8 installation. How to Downgrade from Windows 8 Pro to Windows 7 Pro? The actual downgrade process is tricky and not a straight forward one. You first need to create a recovery drive for your existing Windows 8 in case you want to bring it back to Windows 8 in future. Once done, you need to disable UEFI and enable Legacy/CSM boot support. You will need a Windows 7 Professional DVD. Insert the Windows 7 installation DVD and boot to it. During the Windows 7 setup, you might need to enter the license key to go past the installation. 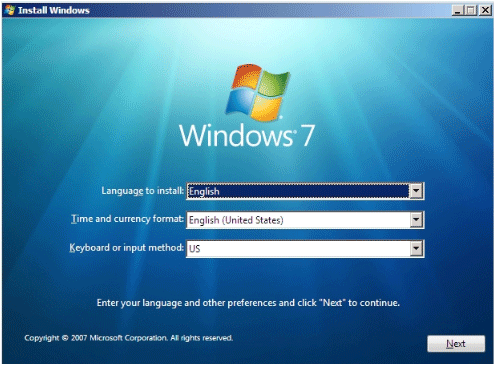 Here you can enter any used Windows 7 key since activation does not happen here. Now wait for the install process to complete. Once the process is complete, your PC might show activation failed message or it will not be activated. This is because you have used a key which is already in use. For getting a new key, you need to call up Microsoft support and explain to them about your downgrade rights. Have your Windows 8 Pro key ready which you’ll need to prove your PC has downgrade rights. Once this is validated, you will receive a new activation key for Windows 7. You will need to do this for all PCs which you have downgraded. You can install back Windows 8 anytime using the recovery drive. If you are the only regular user of your computer then configuring Ubuntu to automatically login without the need for a password when powered on is an easy way to speed up the startup time. 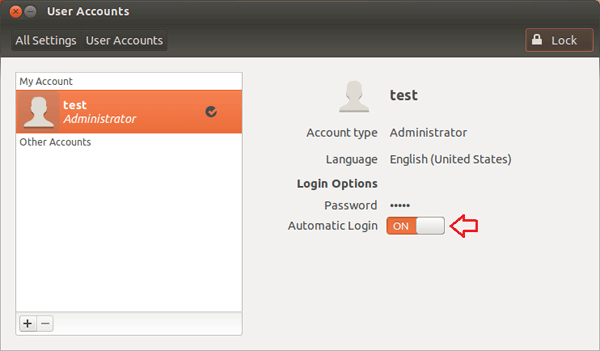 Just follow the tutorial outlined below to make Ubuntu automatically logon to your user account without asking you for a password. This will just skip the login screen instead of removing the login password. How to Enable Automatic Login in Ubuntu? Click the gear icon in the top-right corner and select System Settings. 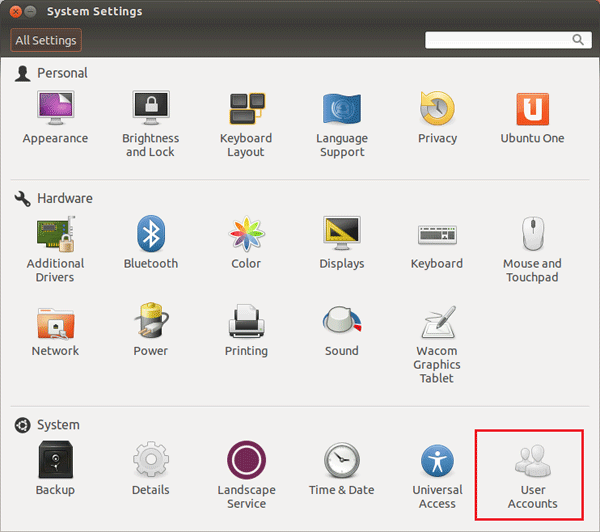 When the System Settings window opens, click on User Accounts. In the User Accounts dialog box, there is a list of current users. Click the Unlock button at the top right corner of the window to make changes. A password is required to make changes to users and groups, and only those users with administrative access are able to do so. Click the button next to Automatic Login. It should now say On. Click Lock to save your changes. The next time you power on your computer it will boot straight to the desktop without requiring a login. In my previous post I’ve covered how to disable the password login screen in Windows 8, so the computer will automatically logon to Windows 8. Though when you put your computer to sleep, the login screen might pop up after wakeup. In this article I’ll show you 2 methods to bypass Windows 8/8.1 login screen on wake up from sleep or standby. Set your View by option to Small icons. 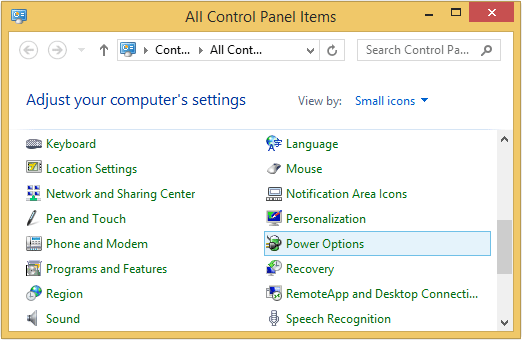 Then select Power Options from the list of computer settings. 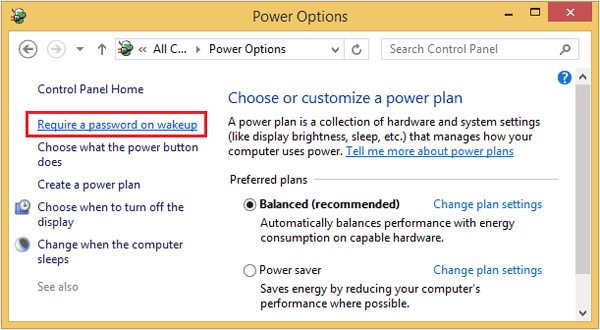 From the Power Options window, click the link labeled Require a password on wakeup on the left-hand side. Click the “Change settings that are currently unavailable” link. Now, you can select Don’t require a password under Password protection on wake up. Click on Save changes. From the Start Screen, open the Charms Bar (Windows key + C). Go to Settings -> Change PC settings. Go to Accounts -> Sign-in Options. 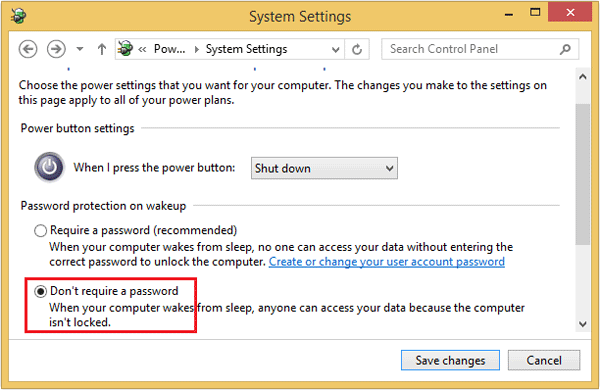 Under the Password Policy section, click on the Change button to get “Password is not required when waking this PC from sleep”. Reboot your system and it won’t ask you for a password next time you wake it up from sleep. How to bypass the Ctrl+Alt+Del logon prompt? One way of adding an additional layer of security to your computer is by enabling secure logon. By enabling secure logon, users are required to press Ctrl+Alt+Del before they can enter their credentials and log on. However, if you’re tried of pressing Ctrl+Alt+Del every time you turn on the computer, there are 3 easy options to disable the secure logon. Press Windows key + R to bring up the Run box. Type netplwiz or Control Userpasswords2 and press Enter. When the User Accounts applet opens, click on Advanced tab. Uncheck the Require users to press Ctrl+Alt+Delete checkbox. Click OK. The next time you start the computer it will boot directly to the login credential dialog box, without prompting your to press Ctrl+Alt+Del. Press Windows key + R to bring up the Run box. Type secpol.msc and press Enter to open the Local Security Policy Editor. Navigate to Security Settings -> Local Policies -> Security Options. In the right pane, double click on Interactive logon: Do not require CTRL+ALT+DEL. Select and set the radio button of Enabled. Save the policy change by clicking OK.
Press Windows key + R to bring up the Run box. Type regedit and press Enter to open the Registry Editor. You should see a DWORD (32-bit) entry named DisableCAD in the right pane. Double-click it and change its value from 0 to 1. Close Registry Editor and you’re done! Unlike a password, fingerprint login (also known as biometrics logon) isn’t vulnerable to brute attacks and can’t be guessed. 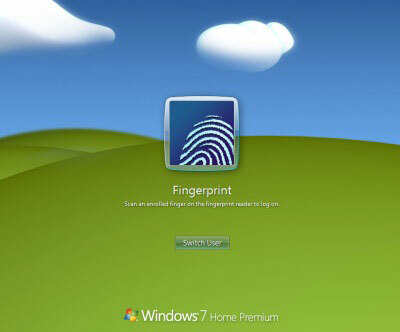 By sliding your finger across the fingerprint reader, it will read the fingerprint and determine whether that person is authorized to use the computer. If they are, the computer automatically logs you on. 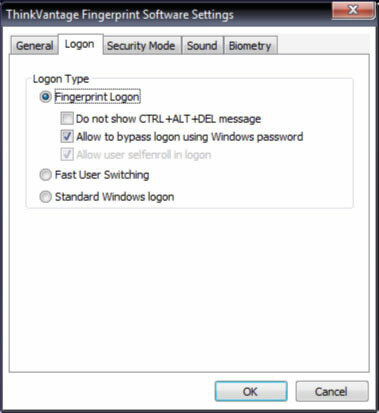 In this article I’ll how you how to setup the fingerprint reader on Lenovo laptops. How to Setup the Fingerprint Reader on Lenovo Laptops? If you have not enrolled your fingerprints, go to Start > ThinkVantage > ThinkVantage Fingerprint Software > Control Center. When the ThinkVantage Fingerprint Software dialog box opens, go to Fingerprints > Enroll or Edit Fingerprints. Follow the steps in the User Enrollment wizard to successfully enroll your fingerprints. Before fingerprints can be registered, you’ll be asked to type in a password. This is to ensure that the user is the computer owner. If you enable the integrated fingerprint logon, it is recommended that you keep the option of logging in using your password. To enable the integrated logon, go to Settings > System Settings. Click OK. You will prompted to reboot for your changes to take effect. Using your fingerprint to log in won’t just save you time; it’s more secure than a password since a fingerprint is nearly impossible to spoof. You’ll rest easy knowing that the only person with access to your PC is you. If you have password protected a Outlook data file (.pst), when you try to import or open the .pst file in Outlook, a dialog box similar to the following appears. Without the password, you cannot open the .pst file, and you cannot access any of mail messages it contains. Microsoft is not able to help you retrieve lost file passwords. If you’ve forgotten or misplaced the password to a Microsoft Outlook data file (.pst), you can recover it easily with the Outlook Password Recovery program. 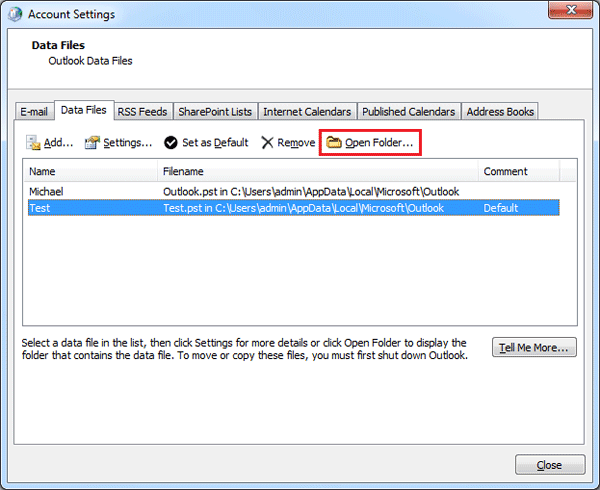 Before getting started, you need to know where your Outlook data file is saved. Open the Mail applet from the Control Panel. Click on Data Files button. This will open the Account Settings window. 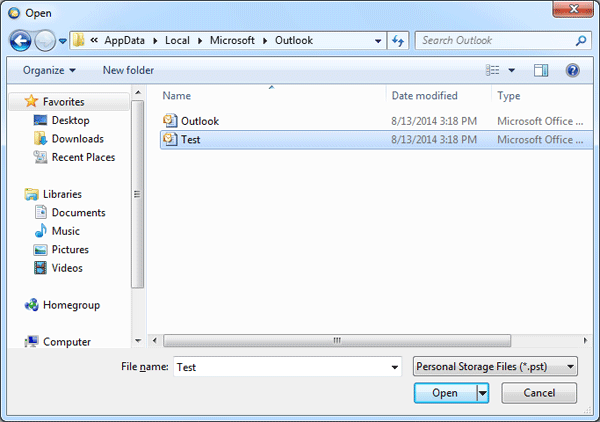 Click the Data Files tab to see your Outlook data files, including PST and OST files. 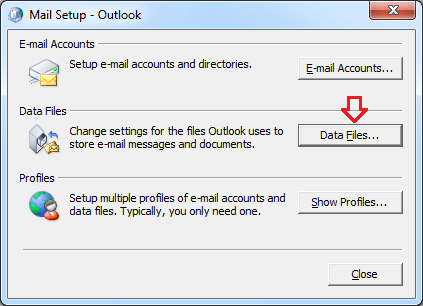 If you have multiple accounts in Outlook, you may notice several data files listed. In my example, I want to recover the password for the Test.pst file. 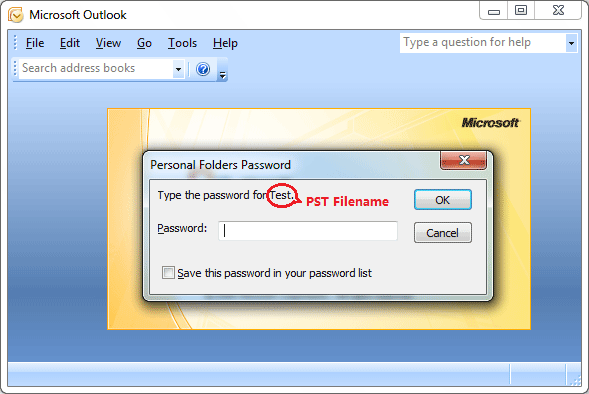 Select your password protected PST file, and click Open Folder button to open the folder containing the PST in Windows Explorer. Download and install Outlook Password Recovery on your local computer. 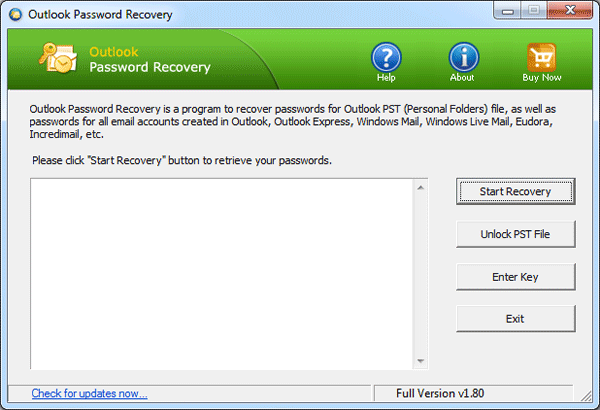 Open up the Outlook Password Recovery program and click on Unlock PST File button. The File Open dialog will appear. Choose your password-protected Outlook data file (.pst), and click Open. The program will start to decrypt the PST file and provide 3 different passwords. You can then use any of them to unlock and open your password-protected Outlook data file. With this method you can recover forgotten password for Outlook data file (.pst) that was created in Microsoft Outlook 2016, 2013, 2010, 2007, 2003, 2000. After opening your Outlook data file, you can then remove or change PST password within Outlook application.